A Summer Love winner, my beautiful melamine and a giveaway! Good Saturday morning. Today is a day of celebrations and giveaways. 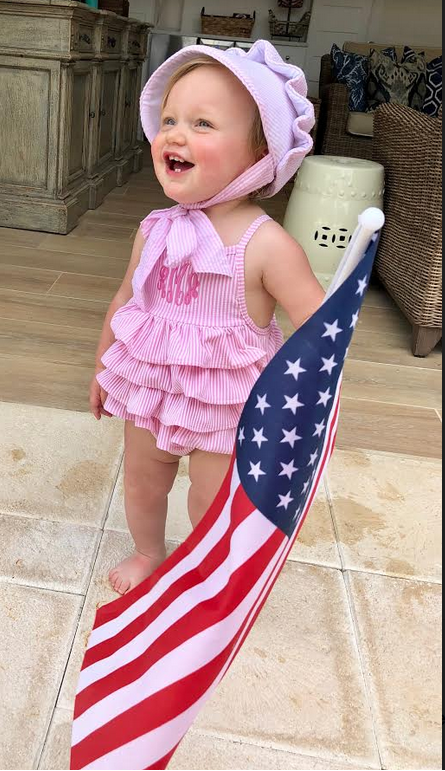 First I want to officially crown the winner of the Summer Love contest, congratulations goes to Ed for submitting this winning picture, this cutie pie looks like she loves summer and bonus points to her for sporting monograms! Please contact us at info@enchantedhome.com to claim your prize and provide your shipping info so your first of three goodies can be on it’s way. So today a look at all three of my beautiful patterns “in action” including two recent tablescapes that I really love and a giveaway. To top it all off, through tomorrow all melamine is 20% off the entire collection. One lucky winner will win 2 place settings plus a serving bowl (pattern of their choosing). All you need to do to enter is leave a comment on this post telling me your favorite pattern and where/how you would use it. Tomorrow morning I will announce the winner. Clearly these melamine pieces prove they have as much right to be set on a table with a white tablecloth just as much as their competition, the almighty porcelain plate. I use mine daily inside and out, and love that they can’t chip or break, but still look great at the same time. Best part is every piece is now back in stock. If you don’t have any and suddenly find yourself “needing” some melamine in your life, take advantage of the extra 20% off through tomorrow. Click here to see the entire collection. You can thank me later:) Thanks for stopping by, wishing everyone a fantastic Saturday and hope your weekend is off to a wonderful start. Until tomorrow…..
Love the original Blue/White so classic!! I will use it inside and out! Love the classic blue & white! Would like to use on the boat when we cove out!! I like the blue flower design. Reminds me of Herend Blue Garland pattern. I would use for outdoor entertaining and casual indoor luncheon with my girlfriends. Tina, these are truly beautiful! I love the blue and white- I would use it everyday! Love the blue and green. I would use it on my back porch where we enjoy many evening meals. All are beautiful but the new green and blue pattern really caught my eye today! I’d use it everyday with my family to add beauty! Company too! It’s gorgeous! I love the blue and green set. I use those colors all through my house and they would be perfect on my porch. I have antique white wicker with blue chinoiserie upholstery. Perfect! I like the blue and white classic the best, but blue and green a close runner up. I love all the patterns but favor the new blue/green. Your table settings are stunning! My favorite is the original blue and white which blends well with my everyday dinnerware. But after seeing the new patterns, I am lovi ng the new blue and green more. It is so fresh and reminds me of the spring season. What a tre@t to start the day with a breath of spring being served up!! I really like the blue/green set! I would set a display on my breakfast table as it has my colors and so cheerful!! Just the blue and white does it for me, love the oriental design. Just right! Love these sophisticated melamine patterns. I will be using mine at our cottage for special dinners and events. The new blue and green would be perfect for outdoor dining. All the patterns are appelIng to me..you did an amazing job. Hi Tina, I love them all but if I had to choose one it would be the blue,green pattern. I need to use mélanine a lot more now with my arthritis. It is so nice and light. Thanks for creating these. I love the blue and green pattern! It would be perfect for outdoor dining by our pool. The blue green pattern would add so much to my al fresco dining scene. Your wicker salt and pepper shakers need an elegant place setting. What a lovely creation! Perfect for dinner with the hubs or an alfresco dinner with friends. Love the classic blue and white. 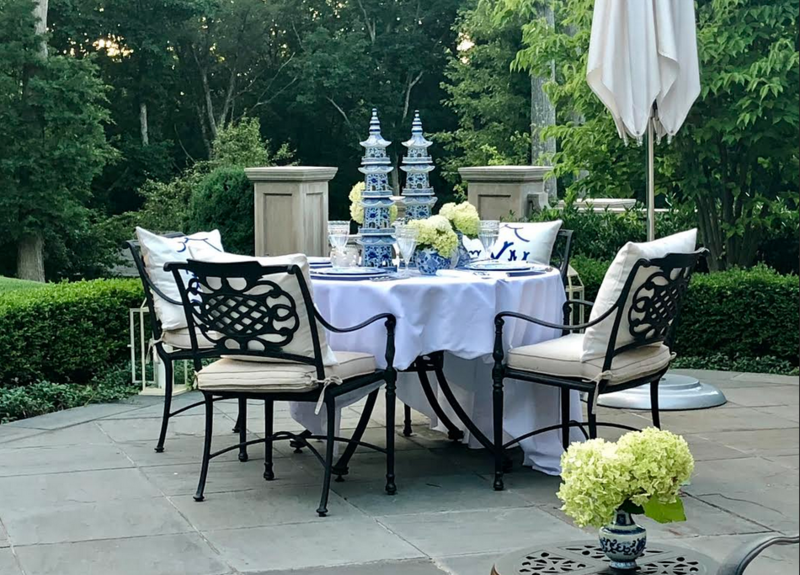 Our patio is decorated in all blue and white and it would make a beautiful tablescape on the patio. I love the new blue & green pattern. I am in a Southern Living cooking group. Would be great when hosting a casual summer lunch! Love the new pattern, I would use it for outdoor beach parties, under white tents . Beautiful, no worries about breakage carrying to & from the event. Add plastic cut glass tumblers full of flowers, simple, easy , elegant. Your melamine is all so lovely, but my favorite is the green/blue floral. It is so very special and I would use it for my family holiday gathering. Somehow, working in a bit of red to bring a glorious holiday feel would make a sensational table setting. This was a hard decision! I would pick the blue/green combination and take it to the picnics in the park with my husband and enjoy the beautiful Chicago Symphony Orchestra playing at the Pritzker Pavilion. Love the precious blue/green pattern. My favorite!!! Thanks! Absolutely love the blue/green pattern. What a great table scape for my Ethan Allen Wicker table/chair set outside on my screened in porch. I love what you have done with all the patterns. Your table scapes are so Beautiful! Happy Saturday! I’m lovein the blue and green! Hey Santa it’s time for Christmas in July! I love the original blue and white pattern. I would use it everyday inside and of course when I dine outside! All really pretty, but am loving the orange and blue in particular to jazz up my table a bit. Oh my! I am absolutely in love with your beautiful melamine patterns! I don’t know which one is my favorite! Thank you for the opportunity to win 2 place settings! I purchased the original blue and white and loved it then. I added some of the orange and blue to it and live mixing it. I use it outside and inside. It is also perfect for when my grandchildren come over !! Love the blue and green would work beautifully on my covered porch. Stunning! You have once again outdone yourself! The melamine collection is one of a kind and stunning! I would love to use for my outdoor entertaining! Love your posts. My favorite melamine pattern is the blue and green. I would use the sets serving breakfast , lunch and dinner on my side patio surrounded by my peonie and rhododendrum garden ,garden wall and my 85 year old 4 season porch and home. Sitting on my side patio whether in the morning sun ,afternoon daylight or under the stars in the evening , one feels like they are in a old European setting. The colorful plates and patterns would only enhance the atmosphere! I would use the blue and green pattern at an al fresco breakfast for two in my backyard with all the green trees to compliment it. 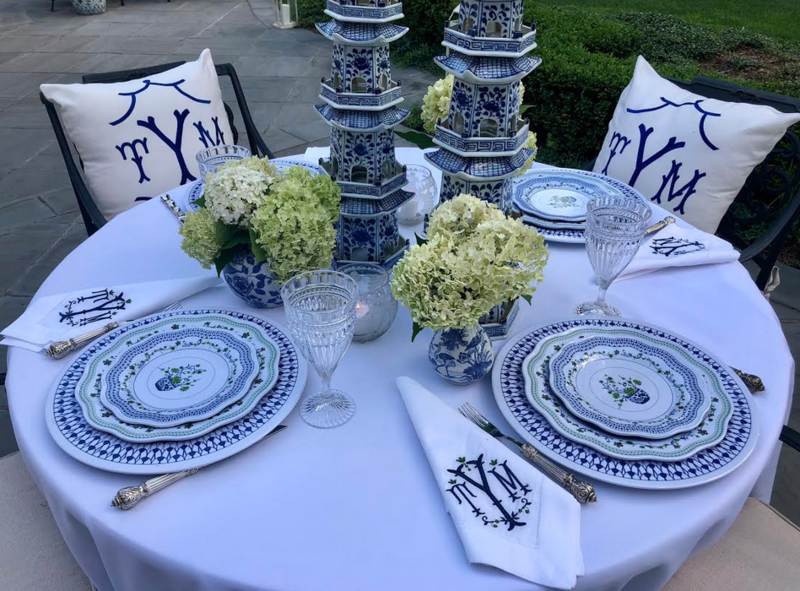 I’m a southern girl so of course I’ll be yearning for the classic blue and white for dinner parties and luncheons on our veranda! And it’s melamine—did I mention I live in a household of boys??? Hi Tina! We host Easter and the original pattern will look gorgeous for our dinner table! Love the traditional blue and white and the blue and green is gorgeous too! I would take them to the beach house! The blue/orange combo is amazing. I can see it on a table mixed with my orange Fiesta ware. Love all the patterns but my fave is the blue/green. I’d serve a light lunch to one of my BFF on my deck using a green cloth and napkins with a bowl of wildflowers. So summery !!! The blue and green, for our blue and green screened porch! I like to mix the original pattern with the orange/blue pattern. Use every day!!! I choose the blue and orange because it will go to a friend’s cabin on the river (and matches her decor)! Love it all …but the blue is my fav! I love,love your new blue/green pattern! I would have a hard time deciding whether to use it at my home on my screened in porch or take it to our beach house. It would be beautiful in either place. I think they are all wonderful but would choose the blue/green dinnerware. I think it is so fresh looking for summer. Great with the “grands” and yet party ready. Very pretty and would use it daily. Love, love, love the original blue and white pattern! It would be perfect on my back patio and garden w at the beach. I love the blue and green pattern, so pretty and functional!! I love all of the patterns but I am partial to the blue/green pattern. Inside or out, they are all beautiful. Thank you Tina, for your creativity and inspiration. Love the new blue/green pattern. Would use in our coach when we travel! How do I choose??? If I could just have one it would be the blue/green floral. If I could have two I would mix the blue/orange Pagoda with the blue and white. So happy melamine is back and so beautiful!!! I love them both! How fun to use orange zinnias with the blue/orange or hot pink zinnias with the blue/white! Happy table setting ya’ll. Love the traditional blue and white! I would use my place settings outside to eat when it gets cool enough. It is still way too hot to eat outside in Tallahassee. I love the blue and white with green pattern. I have 4 plates already but would love more! My favorite is the original blue/white. I’d use it in my kitchen as a lighter weight and much prettier alternative to my current white Corelle for every day of the week. I love them all, but would love to have the orange melamine to set my Fall table! Love the blue-green. I would use it every day to perk up my meals! All of the patterns are lovely.
. 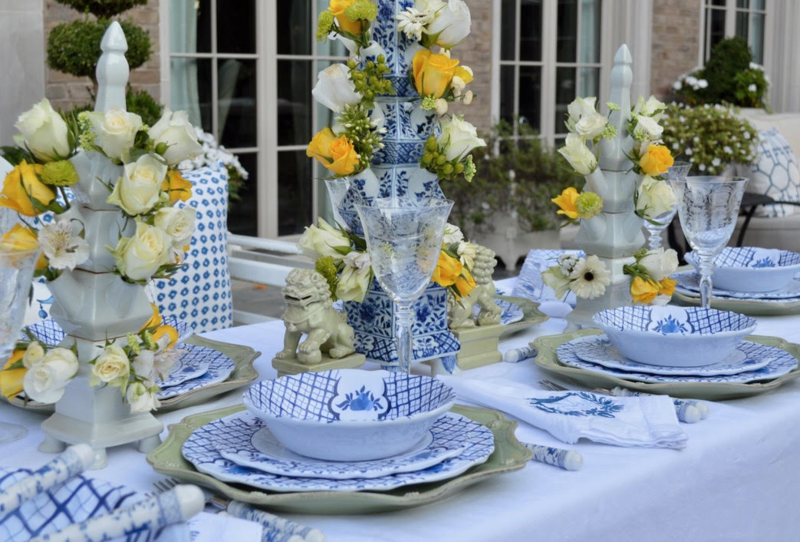 I am having a ladies luncheon and looking forward to setting a beautiful table using the blue and green dishes. I know my friends are going to love it as well. Love the classic blue and white, but really like the green as a accent plate. so pretty and it really does look like china. I would use inside and out, summer and winter, at my home in Lowcountry! I love the classic blue and white. I am looking to replace my everyday dishes. These would most definitely serve that purpose!! Good morning. Terrible storms in Louisville last night! Porch is a mess but your melamine would have survived!! All the patterns are so lovely that it’s hard to choose. But I just really love your first design with the pagodas. I would joyfully serve any meal on it. I was thinking too that if I had a few extra, I could make a little plate wall over my kitchen window, above my sink. Add some flowers in pink and yellow by the sink and voila! My little kitchen vignette. I’ve been searching for Melamine plates to use on my outdoor patio. The blue/green pattern at the Enchanted Home is my favorite. Would love to have them. I have some serving pieces of the blue/white and green/ blue. Would love to add to what I have! Really love this melamine. Enjoyed on the deck table, along with delicious food and happy conversation. Tina, your table settings are spectacular ! You make me want to go and set a table even though I have no reason ha ha. Hi Tina! I love the melamine dishes!! I would love to have them for my patio outdoor summer evenings when we grill. I also love to treat friends to wine and snacks on the patio. Perfect!! Have always loved the blue/green floral pattern ever since you first introduced it! I think they would be so lovely for a girlfriends luncheon! Green and blue—like hydrangeas but they won’t fade away! Would use for breakfast on the terrace ( or in deep Winter would use for breakfast in bed). I like the orange/ blue pattern because it can be used in the NC mountains and in Fl. Also, I had the pleasure of attending a fundraiser which featured James T Farmer lll as the speaker. Delightful!! Please check out his list of books and magazine articles! I have been challenging myself to create lovelier tablescapes. Have already purchased the original blue and white and need two more place settings and two more serving pieces. We like to have dinner on the deck with our neighbors who enjoy the table decor as much as the menu! Thanks for the inspiration. The original blue and white has been my favorite but I am beginning to love the blue and green mixed with blue and white for a different look. I love the original blue and white and use mine constantly! I would like to add pieces of the other two sets to mix and match!! The Classic Blue and White matches my blue kitchen and adjoining family room for casual dining. 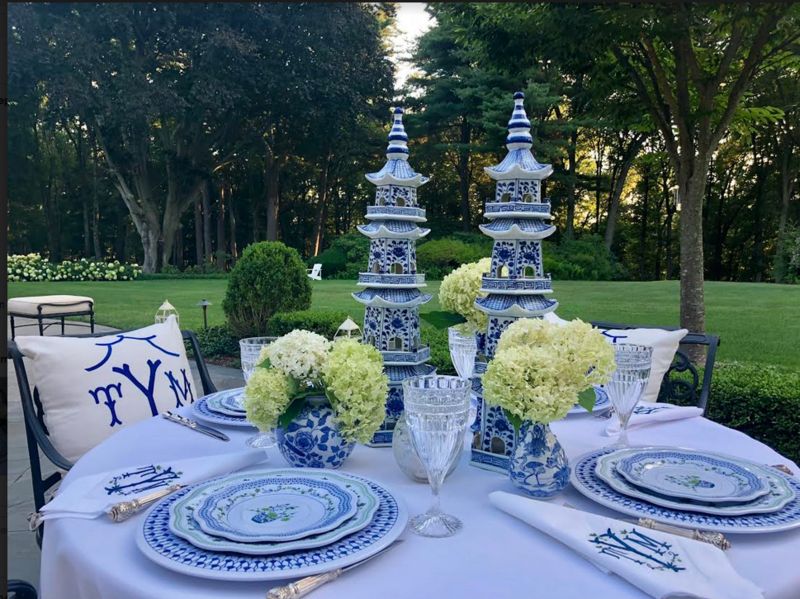 It would also be extra special for the grandchildren’s table in my bright pink dining room, giving them a classic look without endangering family heirloom china. I would use the blue/green pattern to mimic the natural colors I see from my lake house deck. Lovely! Picking a favorite is difficult, but I guess I still love the pagoda! Love the blue and green. As you, I would use it every day inside and outside. All are beautiful classic patterns compared to local stores’ modern looks. Being that Autumn is my favorite season and we celebrate several October birthdays, I can see my dining room set with the orange and blue. 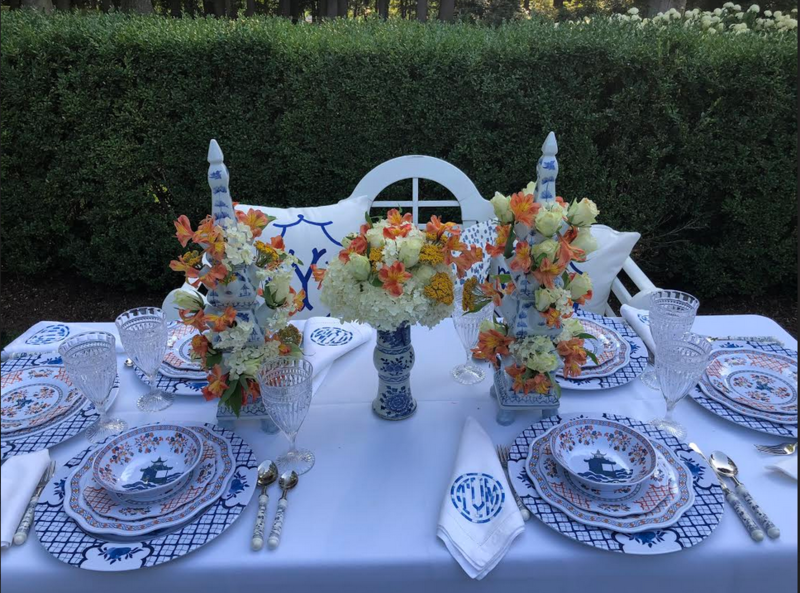 Add pumpkins, dried Limelight Hydrangeas, mums, and monogrammed white napkins with blue lettering or navy napkins with white lettering or go bold with orange lettering- gorgeous! All three are beautiful, but I think I especially love the new blue/green pattern. I’m with you, I think they make great everyday dishes for inside as well as outside dining. Practical and pretty! Love new blue and green pattern! I love the new blue and green pattern- elegant but simple. Perfect for an evening on the porch by the river! I am a sucker for the original blue and white. Can’t get enough! I love blue and green pattern. Bought it for our outdoor terrace where it was made to match my colours! I love to see how you put the table together for all the patterns! My favorite is the blue and green, but they are all lovely. I love the new blue green patterns. I would use them on the patio for brunches and in my solarium for afternoon tea. They would be the perfect compliment to the greenery and the blue sky. I thought when you mentioned the winner(which you are right it was really a hard decision ) that not only was the little girl dressed with the monogram but she was also holding the American flag which represents our freedom ….that’s what I thought you were going to say… She was smiling as she held that flag up… she was proud to be an American! Let us not forget that! That being said I really love your blue and green pattern and I would use it up in the mountains and on the beach… You truly are amazing at all the tasks you take !!! I can hardly wait to see what you come up with next… I think I own almost everything in your shop! Have a great weekend! I am a “purist” and love the blue and white! It would make a lovely summer table! My favorite pattern is the new blue and green with its delicate design…reminiscent of an expensive British/Danish china pattern. Love the original blue/white pattern! Would use this DAILY on our new deck. It’s perfect for our lifestyle, especially w my 3 and 4 yr old always under foot 🙂 !! I love the new orange and blue pattern. It would compliment my Ginori “Carnation” pieces on my outdoor tablescape. They are all beautiful, but I would have to say the blue and green are my favorite. Love the original pattern! The crip lines, the mix of blues with navy, and the darling pagodas make a classic design. I would use them every day at home, and also for a little al fresco dining in the country at our farm! I love the blue and white! I would use every day. I would especially use it to set a beautiful table for luncheons with girlfriends. I love them all but the original is my favorite, it’s a classic!!! 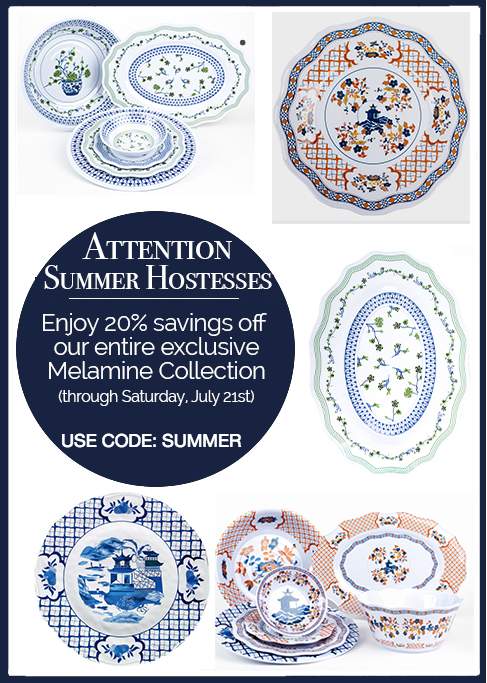 I would love to host a mother daughter summer tea party with the melamine. Thank you for being my weekly dose of everything beautiful and fabulous! All the designs are pretty, but my favorite is the blue and green. It’s nice to have an accent color with the blue. I would use it when entertaining outside, especially with my four grandchildren. Congratulations to the winner of the contest! Loving the blue and green! This would be my first melamine! We love everything about outdoor dining would love the green and blue … reminds mean of the colors I see when sitting on our balcony overlooking the water !! Makes me think of a beautiful waterscape !! Love the blue and white pattern. I fell in love with with the original Blue & White…have been waiting as we have “down sized” and have a fabulous screened in porch that begs for outdoor year round usage… I have Blue &. 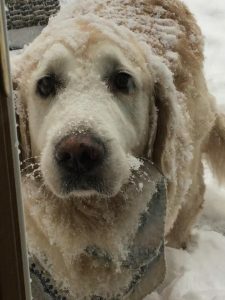 I especially follow to see your tribute to your sweet companion…Wa have been going to Hilton Head for almost 35 years and love Blufton.. welcome.. The original blue and white is my favorite. I’d put it out anywhere! I love the original blue and white!! It’s so classic, sophisticated!! I love the blue and green floral. The B & W pot in the center is the cat’s meow! I would use this on my outdoor glass table to serve a delicious crab or lobster salad sandwich with a fresh glass of tea for lunch! Divine! Your traditional blue and white is my very Favorite!! I got started collecting blue and white from reading your posts, always loved it but was not sure how to bring it in! Blue and white fits with all things! Thank you😊. I would use the blue and white outdoors as well as casual for indoors. I love all three but the original blue/white design is still my favorite! Just turned my deco to blue and green, and so the matching melamine would be lovely. I use melamine every day… just know it doesn’t fair well in the microwave. 😉. Thank you for the inspiration. Every choice is equally beautiful. I love the blue and green. I feel like the green just makes it come alive! Love the blue-green melamine. Would use it for summer dinners on the patio. I love the blue green pattern. Would use this for outdoor dining which I do any chance I get in Minnesota! I love them ALL! 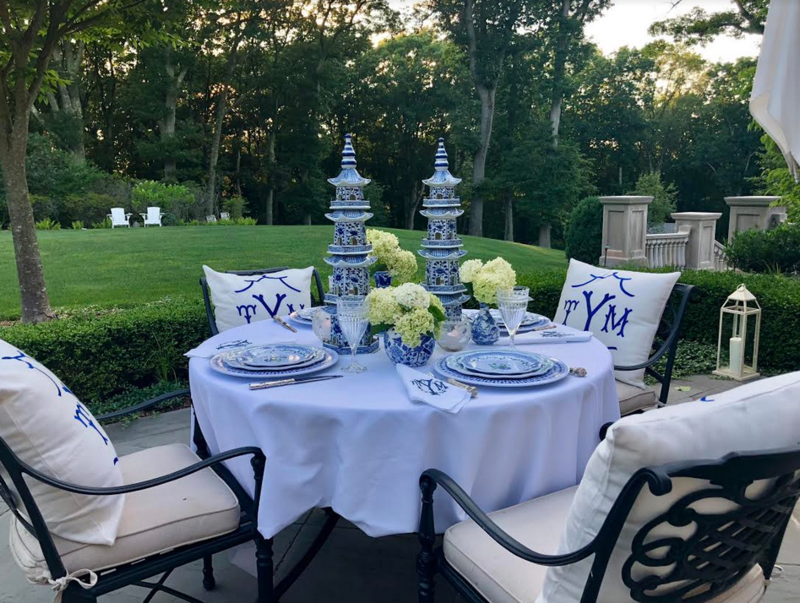 I’m a blue and white gal and when we left our beloved Oak Grove Farm to downsize to a condominium (still in a bit of a shock), I did it all in blue and white! On our balcony overlooking the Chesapeake Bay I added coral and green pillows! The blue and white melamine with the green would be a perfect addition to an al fresco dinner on the balcony!! Love your gorgeous tablescapes!! Love the blue and green pattern. Have ordered the plates but would love to have more. Keeping my fingers crossed! I love them all, but the blue, orange and white pattern is my favorite. It brings back childhood memories of tea parties with my sister and grandmother on her backyard patio. I love the original blue and white, but the new blue and green is a close second. I would use them inside and out! I am in love with the blue/green collection……and would use it on my patio, but probably like you would also use it indoors as it is too pretty not to use more often. Thank you! Love the classic blue and white. So many possibilities to mix with my existing dinnerware. Since orange & blue are my college colors I would pick that pattern. The blue and green pattern is my favorite, but the classic blue and white is a close second. These would be wonderful for an intimate al fresco dinner with my husband when our 3 year old is having a sleepover at her grandparents’ house! Love the blue and green set! I love all three of these patterns so it is hard to choose but I think I still love the Blue and White original pattern the best! Love the classic blue and white, but would like to add the green and blue for layering. Beautiful pieces! I like the green and blue pattern because, for me it is the most versatile. The majority of the time it would be used al fresco! The blue and green is such a delightful color combination. We eat outdoors every day in the summer, not wanting to miss a day of the gorgeous view of Puget Sound from our island paradise. My favorite pattern is the blue/green. I would use it on the porch and on the boat at our lake house. We often take sunset boat rides and serve a light supper. I use paper napkins, acrylic barware and dispo flatware, too. Any chance of that in your future designs? It’s hard to pick which is my favorite as I have blue and white in my home with orange or fresh green pops. I think I would like to do some plate hangers and plates above my shower where the steam still lingers and I need art but durable? The original has always held my heart. Isn’t that a cool idea! Thank you for all the inspiration! The original blue and white is my favorite. The design will look great in my dining room along with my blue and white monogram napkins and the blue place mats. As a Home Economist, I enjoy setting the table for meals, but I also want even my younger grandchildren to feel comfortable while dining graciously. Blue and white all the way! Inside and out, snacks as well. They’re all lovely, but my favorite reminds the original blue and white pattern. It’s “me”! I like the blue and green version. It reminds me of the outdoors with trees and sky and summer picnics! LOVE!! The blue/green pattern. Would usi indoors and out! They are all gorgeous! But my favorite is the blue and white. I would use these for our dinners out back by the pool. I would use these beautiful place setting to celebrate my mothers upcoming 85th Birthday. She is and has always been a Blue and White Goddess and she would be extremely pleased to see that you can now get melamine with a beautiful Blue and White and GREEN pattern.! I love all your decorating idea, tips and your creativity Tina. You make the world beautiful! Absolutely love the new blue white and orange pattern . It is stunning. Will be perfect to use around the riding arena when people are grabbing a light lunch. I currently have two place settings of the orange and blue and am anxious to get at least four more place settings. I plan to use it both inside and out I am also anxious to finish the look with the addition of the chargers and coordinating place mats and/or tablecloth . Tina: Really enjoy your blog and your collections. If I won the contest, I would give these gorgeous dishes [original class pattern] to my daughter who is building a new home in Palmetto Bluff. With three teenagers the durability of the melamine and the elegance of the pattern would be a perfect for eating- inside or out! 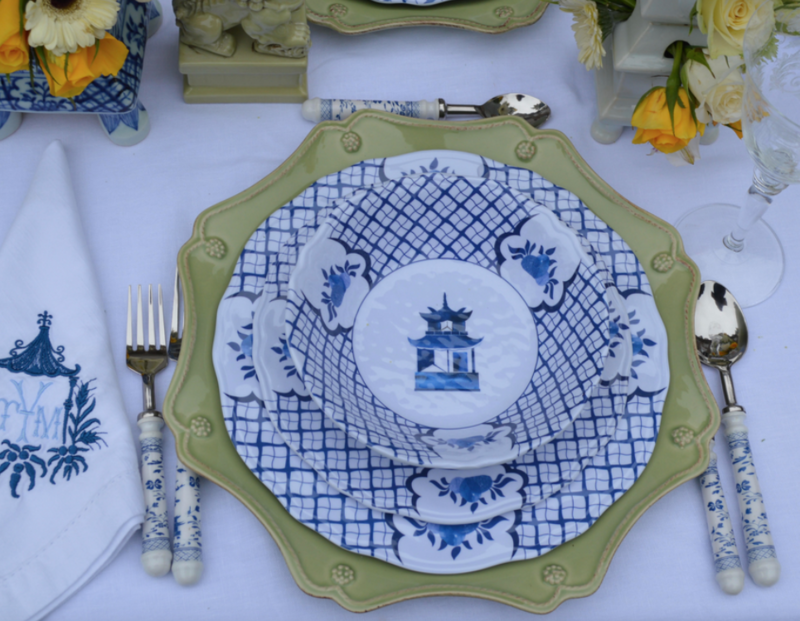 Her many blue and white porcelain pieces would accent these dishes beautifully. Thanks! I love the blue and white best. I would use them inside and outside! I love the original blue and white!!! I would use it out on our patio without any worries that my sons would break it!!! I love the gree and blue pattern. 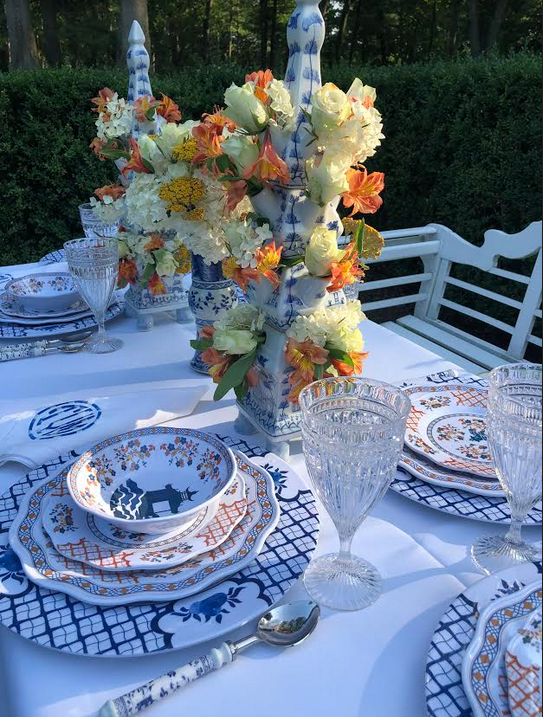 The new orange/blue pattern is lovely and refreshing……I have some nice orange Asian accent pieces that, I bought in Charleston, S.C. 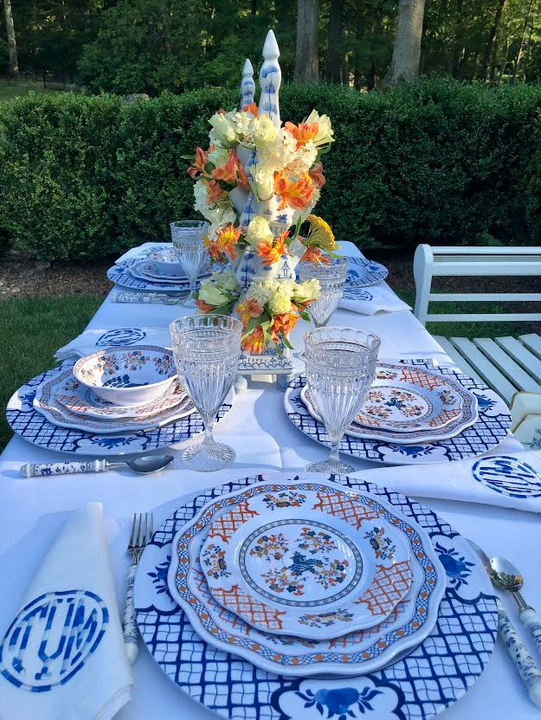 I would add to this collection and have a glorious dinner party on a Summer’s eve…………..
Any of these BEAUTIFUL melamine patterns would make WONDERFUL wedding and housewarming gifts……..so classy and elegant! I love ALL of them and own the original, bought it right when you introduced it and use it all the time. I think this go around I would ope for the orange/blue. Looks so fresh and vibrant and could be mixed with my Imari China. Great job on these, there is nothing else like it out there. The original blue and white is so classic…could never go wrong with it! I will use it for informal dinners on my lovely condo balcony. Will be the envy of our many friends in the building! Be still my heart. I love the blue/green. It speaks my name and the platter is beautiful. Summer is my favorite season so I would be able to use it outside on the enclosed porch or bring it with me to a picnic on the beach. It’s perfect for the beach picnic as there would be no breakage and its light. Can’t wait to see it. All the patterns of the melamine dishes are just gorgeous! The blue and green would look pretty in our dining room table inside and on my table in our gazebo outside! I can picture the grandkids and I having lots of tea parties and sweets on the dishes with their dolls and stuffed bears, oh my! They are always ready for a new adventure. Enjoy your day. Tina, I am absolutely crazy over the blue/green melamine pattern! I love to have my family over for summer suppers. The melamine would be perfect because…..#1 It’s beautiful! (a requirement) and #2 It is child-proof! I have six little grandsons with number 7 is on the way. Plus I already have large solid green plates that could be used as chargers. I literally SIGH when I look at these beautiful pics. Still loving the classic blue and white. SIGH. I like the blue/green pattern. I would use it during my summer parties al fresco. I LOVE the original Blue and White Pagoda AND the Blue and Green melamine. I couldn’t choose between them, so I have and use both! 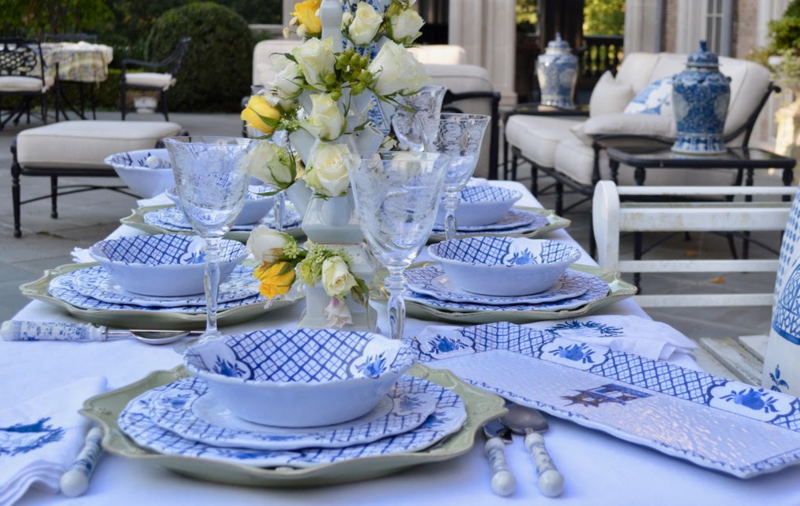 Perfect for parties out on the patio and guests don’t have to worry about accidentally breaking the china! 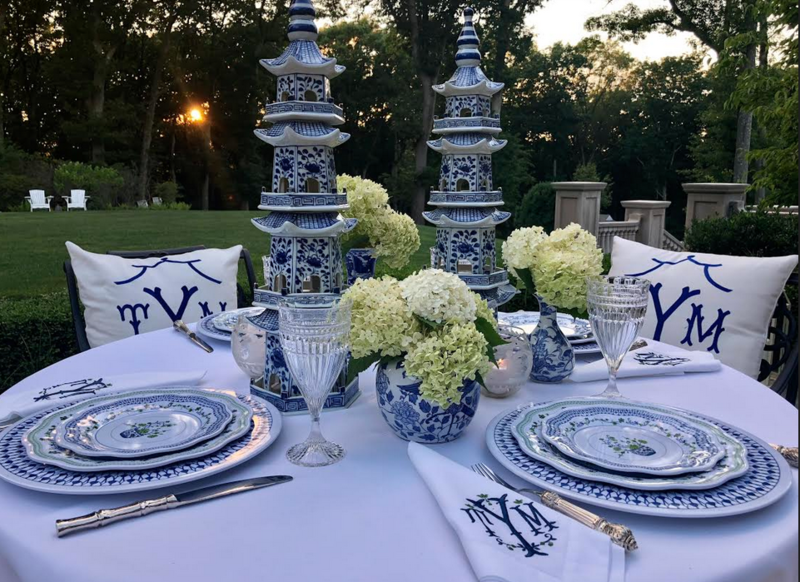 My favorite is the original Blue and White Pagoda because I can set a gorgeous and sophisticated table with [gasp!] melamine! They are so versatile. I LOVE adding your tulipieres, bunnies, and eggs–a perfect table setting for our annual Bunny Breakfast, a tradition I began 37 years ago with our children and now continue with our 11 grandchildren. I like the blue and white original pattern. I would use it when we eat on the deck and pair it with my blue glasses. It’s such a classic pattern. I love them all but really love the new blue/green pattern. I admit that I also love the original blue/white pattern. All are so beautiful! Your original blue/white pattern is still my very favorite! It sets a beautiful table!! I absolutely love the blue/green pattern! This pattern would work so well in my breakfast room, complete with my blue stemware and white table linens. White flowers in a blue and white vase and delicious food completes the venue. Your outdoor entertaining pieces are gorgeous! 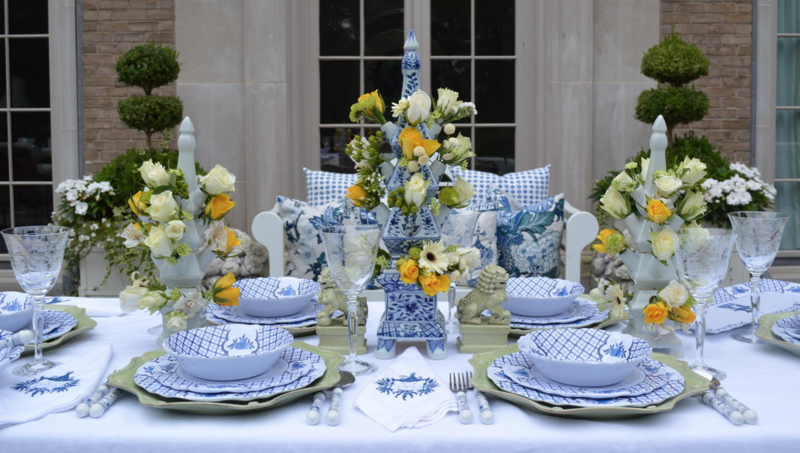 I love the table settings, especially your blue, green and white settings. Tina, I love the blue and green pattern and would use it for a Bridesmaids luncheon at the end of the summer. The platters are the perfect size for fruit and chicken salad. I have many pieces of your porcelain and your tables look so pretty all set with the china and porcelain. I would add peonies to the vases, (if I could find any) or get other ideas from your beautiful arrangements. Green and Blue is really different and my fave! I adore the blue, white, and green melamine! I would love a couple of place settings for lunches and dinners with my little grandson. I want him to start appreciating a beautifully set table at an early age. I want my little Southern gentleman growing up with beauty and good taste. Your melamine is perfect for this. Beauty and unbreakable! Tina , the blue and green melamine is stunning!! I’m sure I would use this inside and outside as I do love to take in as much spring , summer and fall as long as possible. Your monogram napkins really takes it up notch ! Us southerners love monograms on everything!!!!! Enjoy watching PB coming together. Who wouldn’t want to retire there. Truly a dream come true. Tina…you continue to amaze! All the melamine patterns are gorgeous, but I’m truly in love with the original blue and white, since my home is loaded with beautiful blue and white! We have recently painted our porch. Looking forward to spending time and your dishea would be a perfect fit. I use the “original” for dinners on the patio. So classic; but so casual and no worries about breakage! I love the blue and green. We have our dinners outside weather permitting. Our house is on the lake and these would look beautiful on the table. I’d never considered melamine until seeing your plates and your table settings are such an inspiration. Thank you for expanding my horizons! I love the original blue and white pattern. Thanks for the chance to win it! Love the blue and green. But you can’t go wrong with any of the color combinations! They are all so pretty and would be fun decorating with all of them! But, I am a sucker for the original blue and white. Call me a purist! I love the blue and green and would use it everyday in my blue and white kitchen!! I love the classic blue and white!! I would use it in my dining room as well as when we dine el fresco on the deck. Everything looks lovely as always Tina!! Love the new blue and green. My two favorite colors! These are beautiful! My favorite is the blue/green pattern and I’d use it for brunch with a friend. I love the blue/green pattern. I would pack them in a picnic basket and use them at a picnic in the park . I love the blue and green and would use it for a lovely tea party with my daughter! Congratulations to the contest winner! She looks so sweet and happy. It’s a tough choice on the melamine sets after seeing how nicely you did your tablescapes. After much thought, I would have to choose the blue and green set. I would use it to do a lot more outdoor entertaining in my gardens since they are not breakable and look fabulous! My sister and I just moved in together. We are both widowers and did not like living by ourselves. We bought a beautiful small home that is perfect for us. The patio has a table that we would love to use the blue and green plates on. We live in Austin Texas so we eat outside a lot. We love to set a pretty table just for us. We are hoping to meet people so we can entertain soon. Please consider us. We would love to enjoy the dishes. Thank you for giving us a chance. I love the all blue pattern for the melamine, and would use it everyday in the spring/summer monthes! My favorite is the blue and green. I would use it our lake house, both in and out!! Love the original set the best. I would use it on our patio. The blue and white steals my heart! Of course, I love all patterns! 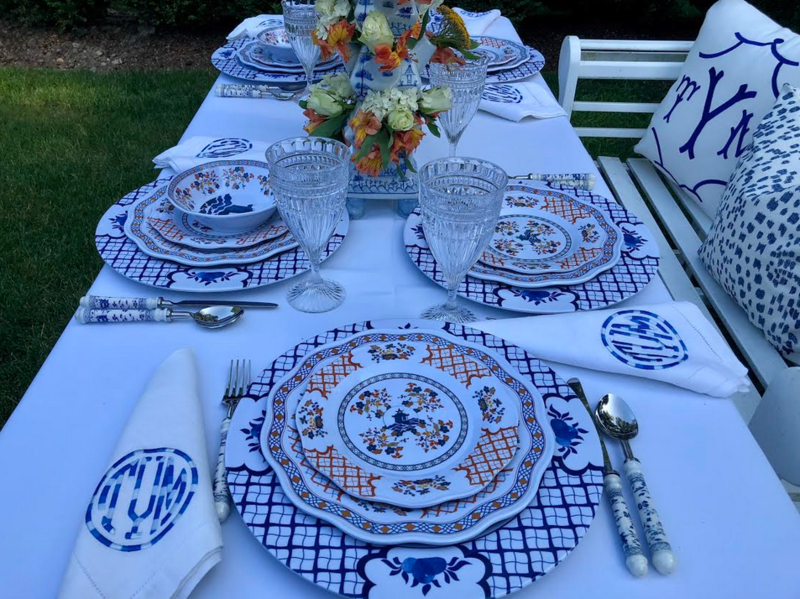 I would use the beautiful melamine not only for fine dining, but also in my kitchen for everyday and on the porch for my hubby and I to enjoy dinner together. Sure wish I could get lucky today! So hard to name one favorite as they are each lovely. 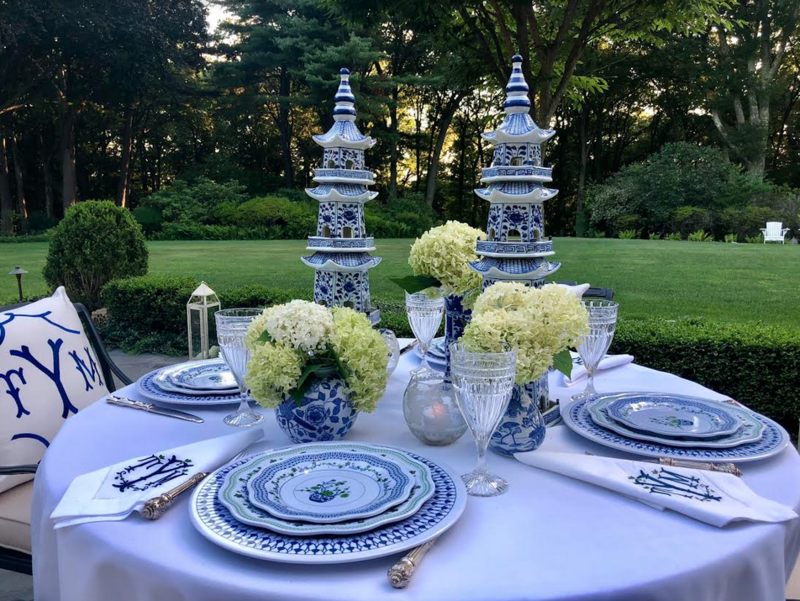 However, the classic blue and white from the original pattern would be perfect for Mother’s Day brunch on the patio since my mom and I both collect blue and white. 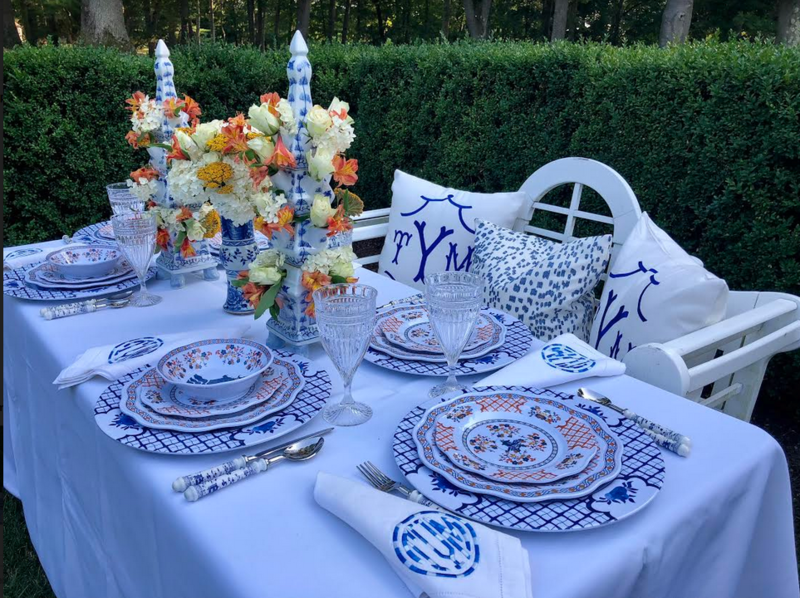 All of your monogrammed pillows and napkins are gorgeous! LOVE the classic blue and white! I would use it on our current evenings at the beach… because post-work summer evenings are so much more pleasant on a beach. I love, love love them all! I guess if I have to choose one, it’s the blue and green! I would use them inside and outside on our porch. They are so pretty! Love your first pattern so much! Have used it a few times and now I’m looking to add some of your other patterns! I live in an old 1920’s Hollywood actor’s apartment. 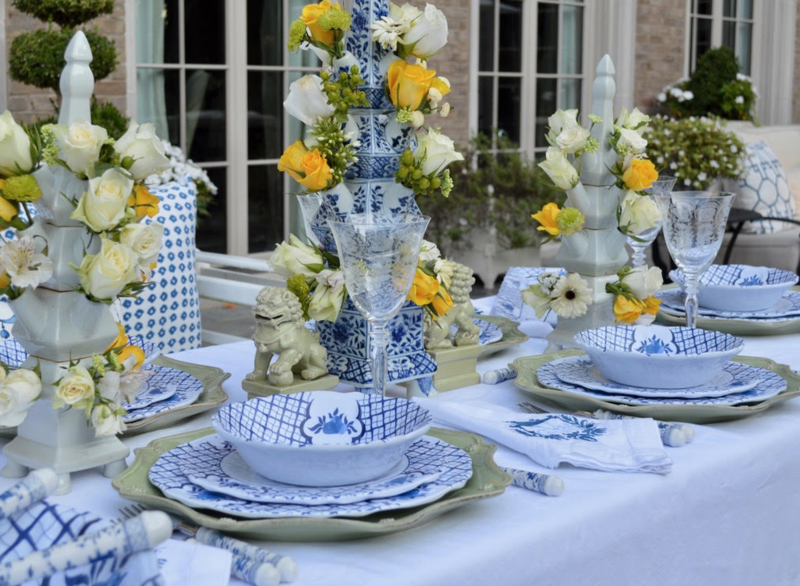 My formal dining is outside- al fresco year round! I love the blue/green pattern but would have to give a nod to California with the orange pattern. Just delightful! Love the original blue/white that I can use for my 4th of July birthday & add a little red for a great classic table! My favorite is the original blue and white pattern because it would look amazing on the dining table of our screened porch. The porch is my favorite room in our house, and I can already see us using the dishes to enjoy a delicious meal there! I LOVE the blue and white pattern. I would use it in my dining room at my lake house where my colors are blue and white of course! Oh my! The blue and white melamine steals my heart! I would use it everywhere! Since my dining room is blue and white, it would sneak in there, as well as my kitchen and my screened porch. Of course there is always that extra snack by the tv in the evening where the melamine would really come in handy! Love the pieces!! !